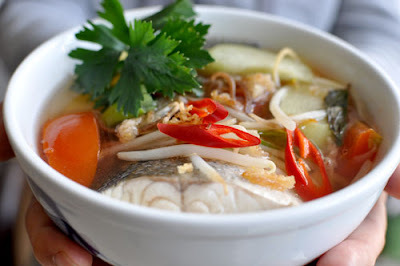 Canh Chua is one of my favourite Vietnamese soups. Always best when my mother makes it and we share it together over some steamed rice. The whole fish then goes into a separate plate with good fish sauce and crushed birsdeye chillis. Its a sweet, sour and hot fish soup. Sometimes, I even use chicken stock instead of water to give it more depth. It is very quick to prepare and it always reminds me of my mum's happy face, the sunshine and being in Vietnam - standing at the edge of water, on sand and flying my kite.